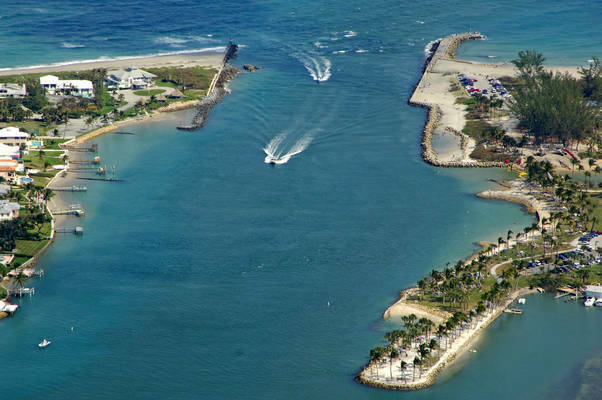 Located 12 miles north of the Lake Worth Inlet and 16 miles south of the St. Lucie River, Jupiter Inlet is the point at which the Loxahatchee River empties into the Atlantic Ocean near Intracoastal Waterway Mile 1005. 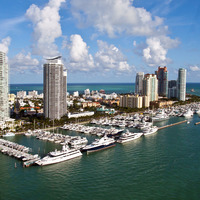 Jupiter is hub of yachting activity, and there are several good marinas located north and south of the inlet on Jupiter Sound and the south Intracoastal Waterway Route in the town of Jupiter itself. The image above is a view from the east looking west over the Jupiter Inlet and farther back into the Loxahatchee River. Off to the upper right (northwest) side of the image is the Jupiter Lighthouse right near where the Intracoastal Waterway meets up with the Loxahatchee River. 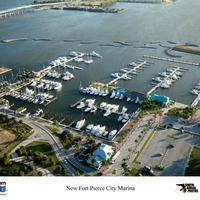 Just opening in the top center of the aerial image is the Jupiter Federal Bridge, which has a closed vertical clearance of 26 feet and operates on a restricted opening schedule. Spanish explorers named the river running into the inlet the Jobe River, after the Native American tribe that lived here. Later, when English settlers found the area around 1763, Jobe sounded to them like the mythological god Jove, or Jupiter, and the name Jupiter stuck. The Jupiter lighthouse was erected near the inlet in the 1800s. 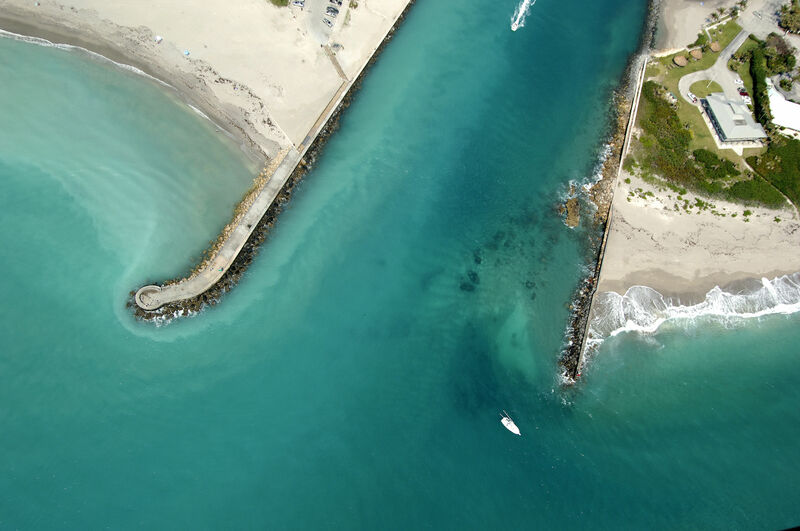 The Lighthouse stands 146 feet tall on the north shore of the Jupiter Inlet. The land that is now Lighthouse Park was once a part of Fort Jupiter, a military installation that was formed during the Seminole Indian Wars. The Jupiter Inlet, although frequently dredged and the site of many jetty and reclamation projects, experiences constant problems from shifting shoals and shallow areas. The current version of NOAA Chart 11472 advises that the inlet should not be attempted without advance local knowledge of the present hazards and shoals in the inlet channel. The outer breakwall jetties are marked with fixed lights, but they are no indication of where the deepest water lies.The image above suggests deeper depths toward the south (left) side of the channel on entrance, but this is only a guess as to the channels current position. Only attempt the inlet if your boat has a shoal draft, with advance local knowledge, and preferably behind a locally hailed boat. Inside the inlet are three different routes. To starboard just after you clear the inlet is the opening to Jupiter Sound, where the Intracoastal Waterway heads north. Straight back from the inlet, the Intracoastal Waterway continues back on the Loxahatchee River until it beds sharply south at the old railroad swing bridge. 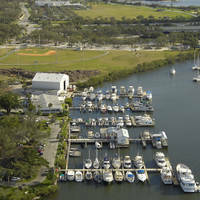 Nearby marinas that accept transient guests are JIB Yacht Club, just north of the inlet and Jonathans Landing Marina, which is about two miles south of the inlet. No reviews yet! 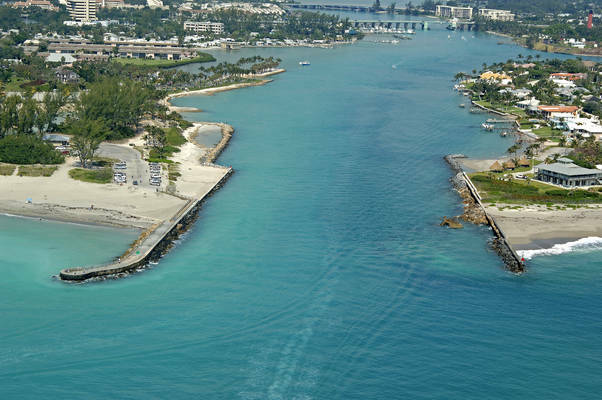 Be the first to write a review of Jupiter Inlet.